This wild yet sophisticated wallet perfectly matches the Bianca Shell for Demi Bags. 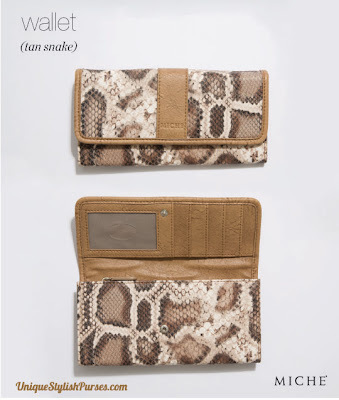 Matte, distressed snakeskin-print faux leather wallet in various shades of brown and cream with tan detail. Interior is lined with plain taupe fabric and has ID slot, four card slots, three open bill pockets and zippered change pocket. Additional zippered compartment on the back exterior. Secure snap closure. Dimensions: 8” long x 4” high.